littleBits is one of our favorite tools that we use in our makerspace, CreateSpace@MFL, located in the Middletown Free Library in Media, PA. The kits are easy to get started with, and people of all ages love exploring and creating with the bits. Our space is an official littleBits Global Chapter, so we create programming around the bits on a regular basis. Additionally, CreateSpace@MFL is a pop-up space, so a tool like littleBits is a great fit for us. We can pack them up in the tackle box or store our specialty kits in the original box and put them in a closet until we need them for a program. 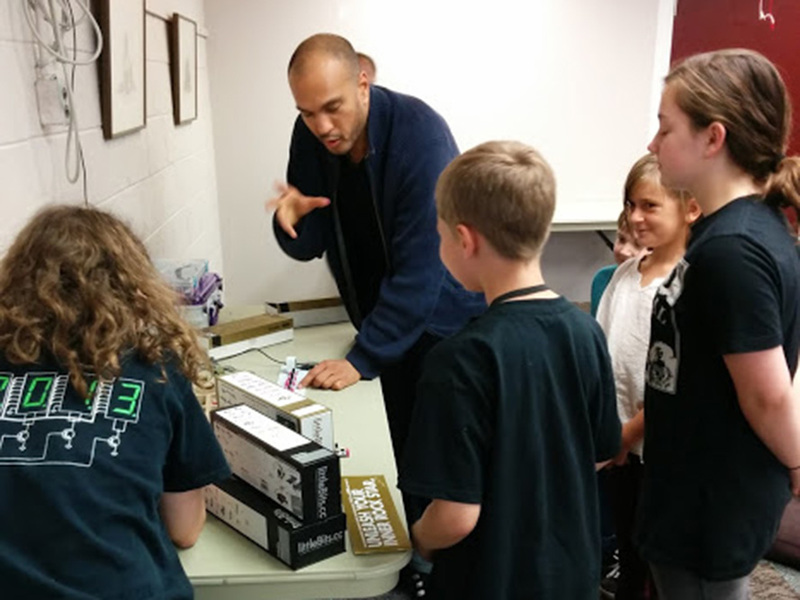 Audio Engineer Isaac Glendening leads a program on creating music with the littleBits Synth Kit. Below you’ll find a how-to for one of our most popular programs: making music with the littleBits Synth Kit. CreateSpace@MFL is lucky to have an audio engineer (and creator of this program) in our community; however, this guide will help you run the program without needing the expertise of a musician who is familiar with making music using synthesizers. littleBits Synth Kit: Kids can work in pairs or individually. littleBits Mounting Boards: While these are not required, the mounting boards are a nice way to keep your project in place while you are working on it. Extra bits: You can use light sensors and LEDs to expand your creations and experiment with adding new elements to trigger sound. We’ve run this program with kids as young as 7 years old, but kids that young do better with the assistance of a parent or adult. The ideal age for kids to work independently would be ages 9 and up. Since each Synth Kit only comes with enough bits to build one complete synthesizer, the group size is limited to the number of kits your library owns. For example, we have 4 kits (including the instructor’s kit), so when we run this program we open it to 8 participants, and the kids work in pairs with one pair sharing their kit with the instructor. This program runs about 90 minutes, giving the kids time to explore sound and share their creations. To prepare for the littleBits portion of the program, you will need to arrange the pieces of the Synth Kit into a chain consisting of a single oscillator, envelope, filter and the speaker. “Today we will become human synthesizers, and then we will get to build and play with a real synthesizer.” Emphasize that each child is going to begin by using his or her body as a power supply. Their minds and bodies will be the power source for their noise making! Ask children to think about a unique sound they could make with their mouths. Make some example sounds to get them started, such as a car’s “vroom” sound. Give children a few minutes to play around and practice making sounds. Encourage noises with long vowel sounds. Sit in a circle with the kids. Go around the room and ask each one to showcase the mouth sound he or she chose. You may wish to have them name their sounds. Demonstrate the various wave forms the kit allows you to choose from. If you feel inclined, draw the waveforms for kids to see. Have children take a minute or two to make their sound again and practice making the movements of their mouth very slowly and then very fast. If time and size of the group allow, give the kids the opportunity to manipulate the littleBits envelope. Review Part 1 and Part 2 of the program and draw parallels between the sounds children are making with their bodies and the Synth Kit. You can also talk about which traditional instruments have fast or slow “attacks” and “decays.” For example, a slowly bowed cello has a slow attack and slow decay, meaning the bow is drawn slowly over the strings and pulled away slowly, the resulting sound is slow to fade. A snare drum typically has a fast attack and decay, meaning the drumstick hits the drum and is released quickly, and the sharp resulting sound fades quickly. 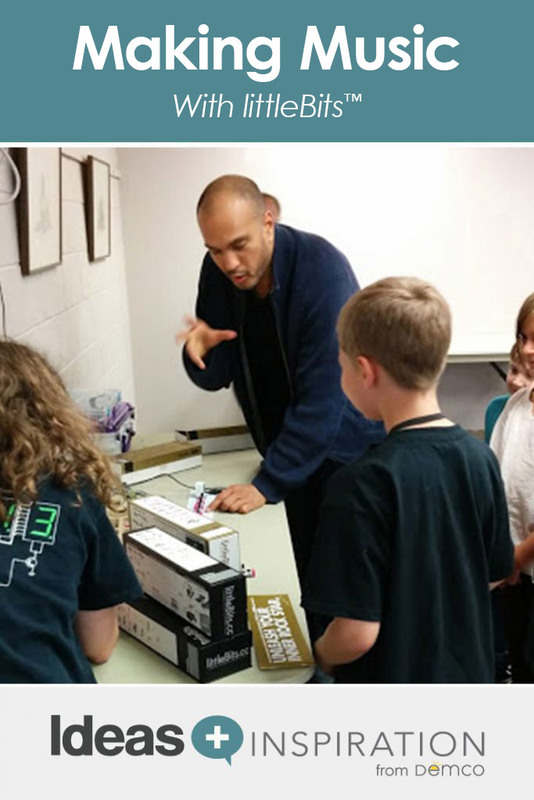 Audio Engineer Isaac Glendening helps participants make their own littleBits synthesizers and lets them experiment at the Digital Audio Workstation. Have each child each present their noise to the group while the rest of the kids experiment with their hands opening and closing over their ears. Relate this experiment back to the filter on your kit. If your group is small enough, allow each child to experiment with the instructor’s kit. Give a general review of what you’ve learned so far, equating the parts of the body with each part of the kit. Have children build their own replica of the instructor’s single oscillator synthesizer. Remember, each Synth Kit only has enough bits to build one complete synthesizer. By this point in the program you should have an idea of the level each child is at, making it an ideal point to split the kids into pairs to work with the kits. Go around and help children create their own unique synthesizer sound. Give your group a few minutes to experiment with tweaking the various knobs, which are called potentiometers. Ask them to settle on a sound, and have each child present his or her sound to the group. Review fast and slow attacks and releases. Then ask children to make a sound with a slow attack and a quick release. Give them a moment to practice, and then have them present to the group. After each child presents his or her sound, ask the group what each noise sounded like. Have the kids swap kits and experiment with each other’s work before presenting their unique sounds once again. Each group should have created a unique sound based on the tweaking and experimenting they did in steps 2 and 3. During the open lab time, we allow the kids time to explore and experiment with the other littleBits modules in the kit. They will have time to use the other modules and create sounds with multiple oscillators, the delay effect and the noise generator. You may want to explain what the other modules actually do, but in our experience, the kids pick up on it quickly, and it hasn’t been necessary. Instructors will have to troubleshoot signal path issues and connections. You may choose to record and email each child a little clip of their sounds, as children enjoy taking their work home this way. We have also opened up sophisticated virtual synthesizers on our Digital Audio Workstation or iPads® and allowed them to experiment. We have had great success with children taking to the software in a familiar environment. In about an hour or more, they have gone from the equivalent of creating cave paintings to making Pixar films. Getting Started With littleBits: Prototyping and Inventing with Modular Electronics by Ayah Bdeir and Matt Richardson. This book is a good introduction to littleBits. It describes the various bits and how they can be used. Chapter 3 covers “Music & Motion” and includes a good introduction to synth kits as well as a sample projects. This title would be helpful for an instructor to review before the program. littleBits Explore Inventions Page Choose the Synth Kit to see a variety of inventions and projects that can be created using the Synth Kit. This is a great resource if you are looking for inspiration for future programs or a specific project to work on with your group. 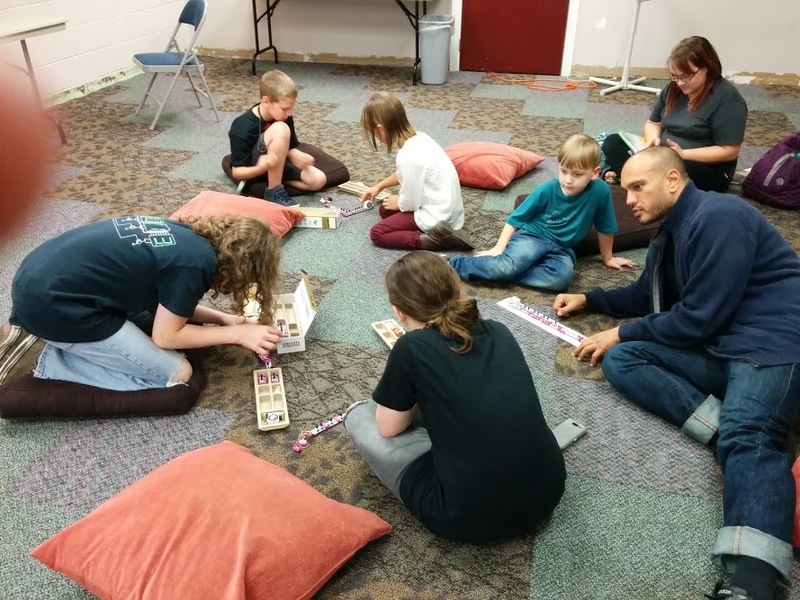 Mary Glendening is the Director of the Middletown Free Library in Media, PA. Mary has been running maker programs at the library for 3½ years, and has been successful in winning several grants to start and expand the library’s pop-up maker space, CreateSpace@MFL. Mary has a book scheduled to be published in September by Libraries Unlimited based on a popular maker program she created at the library called “From Video Games to Real Life: Tapping into Minecraft to Inspire Creativity and Learning in the Library.” Mary has presented her library’s programs at World Maker Faire NY, 2015 LITA Forum, Pennsylvania Library Association and most recently at Maker Educator Convening. While Mary does not have a technical background, she loves picking up new skills and sharing her love of making and the Maker Movement. Isaac Glendening is one half of the band Cesium 137 as well as an audio engineer and owner of Subversive Sound Studio. Isaac became enamored with the rising dark-electronic music scene in the mid-1990s and began collaborating and performing with a friend as Cesium 137 in 1997. Isaac has worked with the Middletown Free Library for the past few years, lending his expertise in audio and music production in support of the LSTA that brought CreateSpace@MFL to life in 2014. 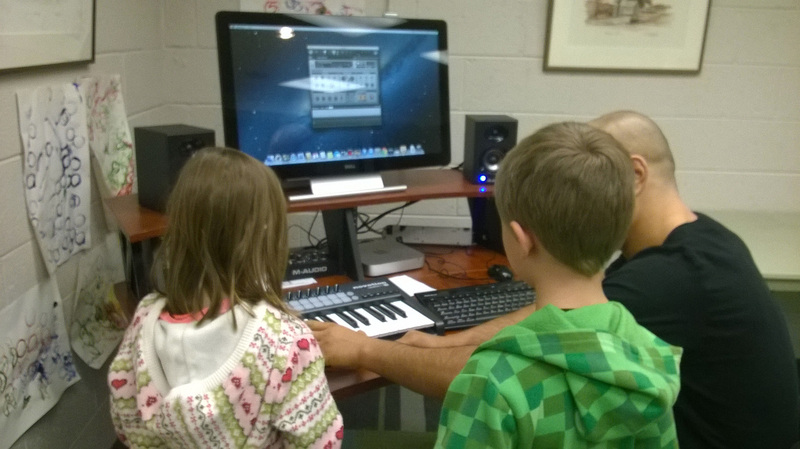 He set up the library’s digital audio workstation and runs music programs at the library. 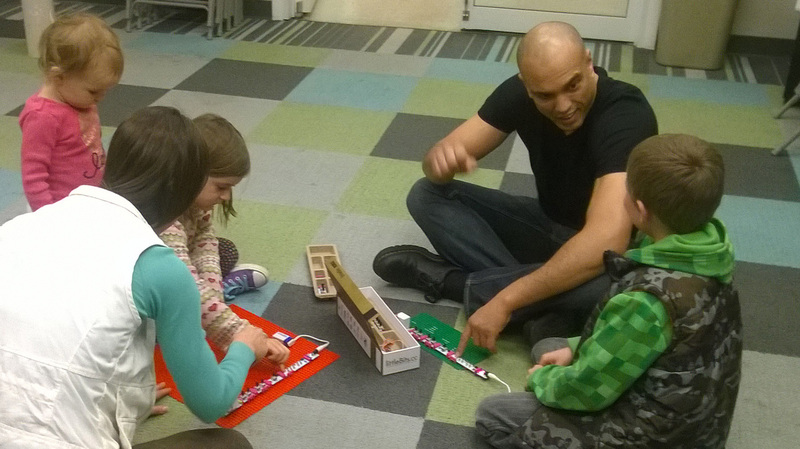 He introduces kids and teens to the wonders of audio through iPad® apps, soft synths and littleBits.